People in Iran and the United States are enthusiastically monitoring the headlines on the newspapers and the TV channels to see if a historic breakthrough between their countries will finally emerge at the critical juncture when the two rivals are expected to strike a deal over the decade-long controversy on Iran’s nuclear program and move toward a momentous normalization of bilateral relations. After the foreign ministers of Iran and the United States met and greeted each other on the sidelines of the 68th session of the UN General Assembly, and following the groundbreaking phone conversation between the presidents of the two countries in the final hours of Iranian President Hassan Rouhani’s trip to New York on September 27, hopes were renewed that more than 3 decades of bitterness and contention can turn into a new era of cooperation and friendship. 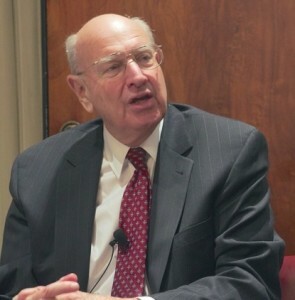 The veteran American diplomat Thomas R. Pickering believes that the election of moderate politician Hassan Rouhani as Iran’s new president has created a unique possibility for Iran and the United States to put aside their differences and disputes and work toward a negotiated compromise over Iran’s nuclear program. He said in an exclusive interview with Iran Review that the people in American and Iran are asking their governments when they can have better and improved relations with each other. It’s now time to strike while the iron is hot. Thomas Pickering is the former United States ambassador to UN. He served there from 1989 to 1992. He has also represented his country as ambassador to Russia, India, Israel, El Salvador, Nigeria and Jordan. The 81-year-old “career diplomat” has also served as the 17th Undersecretary of State for Political Affairs from 1997 to 2000. Pickering serves on the board of directors for CRDF Global and the American Iranian Council. He is also a member of the Council on Foreign Relations. He last ambassadorial appointment was made by President Bill Clinton who designated him the U.S. ambassador to Russia. Ambassador Pickering took part in an exclusive phone interview with Iran Review and talked of the latest nuclear negotiations between Iran and the six world powers, the new thaw in the Iran-U.S. relations, the economic sanctions imposed by the United States against Iran and his aspirations for increased cooperation and collaboration between Iran and his country. Q: In a televised message to the Iranian people in 2009, President Obama underlined his decisiveness for engaging in diplomatic efforts to resolve Iran’s nuclear crisis in a peaceful manner. However, he issued several war threats against Iran since then and talked of all the options being on the table. Why has he shifted his policy and rhetoric this way? Is he under pressure from the interest groups and certain lobbies? A: No, I don’t think so. I think he is seriously talking about diplomacy and certainly was serious about the meetings in Geneva. I think that he has always said that he is not prepared to take other options off the table, but it’s very clear that he is giving priority to diplomacy at the present time. Q: So what do you think are the main reasons he has constantly talked of the possibility of launching a war against Iran, especially in the remarks he made in a meeting with the Israeli Prime Minister Benjamin Netanyahu just after he held a phone conversation with the Iranian President Dr. Hassan Rouhani? A: I think that the Israelis have always been preoccupied with the notion that diplomacy won’t be able to do the job, and that it won’t get anywhere. And I think he has always said that he is deeply opposed to an Iranian nuclear weapon. He is going to try diplomacy as a way to assure that this won’t happen. We are now engaged in that, but he has also always said he is not prepared to take other options off the table, but obviously he sees whether the diplomacy option can work. So I don’t think anything has changed and is different. Q: Don’t you think that President Obama’s calls for military actions against Iran and his famous statement that “all options are on the table” will impede President Rouhani’s efforts to reach out to the United States and take up détente and rapprochement with the West? A: Well, I think that those people living in Iran who might be frightened of that particular set of consequences also have to take into account that certain voices in Iran make similar, if opposite statements at the very same time that the President of the United States and President of Iran are reaching out together and trying a diplomatic solution. Of course not everybody agrees with a diplomatic solution. I think at this stage, we have to do everything we can to give the diplomatic solution a chance to operate. We have to recognize that people on both sides would criticize it, even before they made a major effort to try it. I think those are some problems that have to be contended with. They are not unique on one side or another. But as a diplomat – I’ve been a diplomat for a long period of time, one learns that in a diplomatic process, one has to do his best to overcome those obstacles rather than necessarily let them destroy the process. Q: As you mentioned in one of your articles, the U.S. intelligence community and the UN atomic watchdog have confirmed that there’s no evidence of diversion in Iran’s nuclear activities, and at least in the current juncture, Iran has not decided to build a nuclear weapon. So, why doesn’t the international community accept this fact that Iran does not intend to build nuclear weapons? If there are some concerns, how should they be removed and obviated? How should Iran make more confidence in the international community? A: Well, you’ve described very clearly and precisely what a negotiation can achieve which is hopefully to set aside the suspicions and the concerns. I think that it is of course unfortunate and deeply disturbing that for around thirty years, Iran and the United States had very limited, short and mostly unsuccessful official contacts and they have of course led to suspicions. There have been incidents on both sides that have led to suspicions, fear and mistrust. We see that the environment of our two countries is filled with mistrust fueled by misunderstanding, and so I warmly welcome what is clearly a resumption of serious negotiations. The Geneva talks was of course the first step; it wasn’t a perfect step, but in my view it was a good step and positive step that can lead to a direction for finding a way to put behind the mistrust and the misunderstanding that fuels the unfortunate atmosphere of the present time. You described it very well, and I think it represents a major hurdle that our countries have to overcome. Q: You know that there are certain grievances on both sides; both in the United States and Iran, there are people who complain about the animosities and acrimonies of the past and the marred history of the bilateral relations following the Islamic Revolution in 1979. How is it possible to put aside these grievances and find a solution for removing the differences and establishing normal ties? A: I think you describe very well the current problem. We’ve been talking about it now with some of your questions. We both, I think, could agree that diplomacy is an important way to get out of that problem. Diplomacy has many aspects; the telephone call between the two presidents, meeting of the foreign ministers, the negotiation process between the officials of the both sides. I welcome the opportunity that through you I can get my small voice to the efforts to build some understanding on the relationships, and I believe that people in the United States have welcomed the opportunity which our Iranian friends were afforded by the American media to speak to the U.S. public during the recent visit by President Rouhani to New York and also the foreign minister Zarif. We had dialogs between Iranians and Americans and I believe they have built some understanding, probably not as widespread as we would like, in overcoming 33 years of mistrust and misunderstanding that is going to take some serious time and serious efforts, but one must begin. That’s the most important development of the recent days; the elections in Iran, the emergence of a leader who has put forward very useful and helpful ideas that has to be taken seriously. He represents a very significant change for most of us who have been engaged for the last decade in seeing whether in fact a useful change could be achieved. There’s no value, in my view, in an armed conflict that produces no good results for anybody. There’s some value in diplomatic contact even though many times there’s an up and down affair that does not proceed rapidly and quickly along a tract to success that will require the overcoming a lot of misunderstandings and mistrusts. We are in the early stage, so it is hard at this stage, but with goodwill and firm determination, I believe that real progress can be made. Q: Of course it’s possible to make progress in this path. But as you know, Israel has constantly asked the United States and its European allies to abandon diplomacy with Iran and increase the economic sanctions against Iran. Netanyahu has called Iranian President Hassan Rouhani a “wolf in the sheep clothing”. Is Israel afraid of the reconstruction of Iran’s international position? A: I think you have to address that with the Israelis. I think Israelis are still living in an atmosphere that was very poisoned by some of the public statements made by your last president expressing doubt about the Holocaust and even expressing harsh sentiments about the Israeli people and Israel, and I think those have led to certainly serious reactions on the part of the Israelis. My own sense, however, is that Israelis know that there isn’t a military solution, and everybody knows that, and I think at this point while they may not be enthusiastic about diplomacy, the intelligence and military are quick enough to understand that the best process, and the one that most likely will make progress is the one in which we are now engaged. Q: The government of President Rouhani has pledged to open up a new horizon of relations with the international community. Following his election as Iran’s President, tens of leaders from across the world, including the European leaders and statesmen sent congratulatory messages to him. Given his experience as a nuclear negotiator between 2003 and 2005, are you hopeful that Iran’s nuclear crisis will peacefully come to an end and be concluded? A: I would say two or three things. I think that the election of President Rouhani is the election by the people of Iran. The statements he has made about his aspiration for Iran and Iranian policy in the region and beyond, and his willingness early to address the question of the nuclear issue is far very important and very positive. It’s seen that way by many people in that part of the world. And of course people look at the roots and say that it’s a very important first step that should be now followed by concrete actions. That’s what we are now engaged in, which makes a lot of sense. If one sits back and compares where things were a year ago and where they are now, I believe that a big change can be found and seen in this part of the world and this can lead to something useful. In the meantime, I think all of those who call for a military action have quieted down now and come to understand that military action is not a solution to these problems. You put some emphasis on the nuclear course. This is an important issue. But I would say that on both sides, we need to look further, to have stronger aspirations, and perhaps to think about the whole panoply of problems that exist between the two countries, and see in fact whether one or more areas of progress can help in bringing along a solution or at least to strike a deal on some of the other problems which exist. We are not uniquely, but definitely, in a range of differences over the nuclear questions; we have other areas of differences which need to be solved. My hope is that they can go forward and assist [each other] in bringing about a resolution to the nuclear question. Q: If we look at the course of Iran’s international relations in the recent century, we see that Iran has not been a threat to any of its neighbors. So, it’s not far from reality to claim that Iran has been one of the most pacifist countries in one of the most turbulent regions of the world. Why should the United States be wary of such a country with a peaceful history and call for a coercive diplomacy to solve its differences with Iran? A: Well, I think the answer to that question is one that would take an analysis of some of the differences that have arisen over a period of time, as well as the fact that the two countries have been separated, and so the formula I gave you earlier, that mistrust is fueled by misunderstanding is, I think, a reasonable and rational explanation on both sides why the relationships are not better, that the sense of each side, of confidence in action and their role is seemingly at this stage very low and why people are wary and uncertain and in many cases mistrustful. We have a big period of difficulty to overcome. The only way that it would happen is through a process of talking with each other, and seeing whether we can find answers to those questions. President Rouhani has brought a new face on that particular issue to the table and I would strongly welcome that and I think the other people around the world also welcome it. And now, we have to see how that can happen. There are much of the bad feelings, much of the ignorance and much of the tensions that have existed in our relationships. There’s a great distance between us and the problems that have arisen and uncertainties, but I don’t want to waste your time or the time of the people of Iran by rehearsing past questions that have added to the difficulty rather than focus on the kind of opportunities which are now ahead of us; the opportunity to see whether we can reach at an early stage a nuclear agreement, whether the two sides can find a way satisfactorily to describe the direction on which they want to go and find an agreeable solution; I think that’s very important. [They should have] a kind roadmap [on] how to get there and the willingness of the both sides to bring about compromise. I have voiced disagreement on the sanctions and believe it’s not alone the answer to this particular question. We’ve now turned to corner on the sanctions. Sanctions have been used to see whether in fact, on our side, we could get a useful negotiation go on. Now the important role the sanctions would play is a quid pro co for moves on the Iranian side to reassure the rest of the world by its actions and its commitments that intentions are fully peaceful and totally civil-based nuclear program. I believe it’s possible. Q: Something which should be accepted before the negotiations between Iran and the P5+1 can move forward is that both sides should put forward logical and reasonable proposals and at least make some kind of concessions through which we can be hopeful about getting out of the current stalemate and foresee an end to the confrontations and hostilities. What is your suggestion? What can be the possible concessions which the two sides need to make? A: I think it’s very simple. This would involve, on the Iranian side, a willingness to describe and make the P5+1 understand what its peaceful nuclear program really includes and how and in what way, those pieces can be put together. It should address the suspicions on its enrichment program, and if the enrichment is designed to support a peaceful program, then obviously things like the level of the enrichment and amount of enrichment which have some relationships with Iran’s peaceful intentions should be discussed. I think that’s important that the P5+1 should look at the question of inspections and transparency. Iran has been quite forthcoming in a general way in saying that it accepts inspections and transparency. On the other side, I think, there needs to be a situation in which sanctions become a useful tool for making progress by the willingness on the Western side to release and open up the sanctions as progresses are made along the lines that are just described in terms of understanding and having an extensive limitation on the Iranian program for peaceful purposes. There are two issues we have here obviously: one is to develop some ideas about the peaceful program and setting parameters for such a program, and secondly the monitoring, verification and lifting of the sanctions as a way to encourage and obviously speed up progress toward that understanding. Q: Well, you’ve spoken of the sanctions as a tool to make progress in the negotiations, but we should take into account that the sanctions have had humanitarian impacts in terms of preventing ordinary Iranian people from accessing foodstuff, medicine, medical equipments and as a result, the deterioration of their daily lives. What’s your viewpoint about the humanitarian aspect of the sanctions and the fact that some Iranians believe that the sanctions are violating their basic rights? A: I think medicine and food should not be subject to sanction, so it’s been the U.S. policy. On one hand, the United States has issued licenses for the sale of food and medicine and on the other hand, these are subjects which I’ve discussed with my friends in the American government as we need to assure in fact that the adequate financing and international banking system could be made available so that the sale of food and medicine can go ahead. I think that’s something which I’ve strongly encouraged, and I hope there will be further efforts on the part of the United States government to carry out what has been its traditional policy on the sale of food and medicine. Q: Right. Some of the suggestions you made in the recent article you’ve co-written with Prof. William Luers and Jim Walsh were realized in the recent weeks. One was that the foreign ministers of Iran and the United States conferred on the sidelines of the UN General Assembly meeting. The second was that the presidents of Iran and the United States held a brief phone conversation and before these two ones, we had the congratulatory message President Obama sent to his Iranian counterpart after his election. Can these events lead to the creation of some mutual trust between the two nations, obviate the misunderstandings and open up new horizons in the course of bilateral ties? A: It’s a very good question, and I believe that it’s possible. I remain optimistic at this stage about what we can do to get there. I think it requires effort, it requires commitment and it requires compromise, but I believe that can be done, and the things that you put forward are positive indications of the fact that both sides are committed to that kind of effort. Q: Once the nuclear controversy is resolved, it’s possible that Iran and the United States can sit at the negotiating table and discuss the other problems they have with each other in case of such issues as terrorism, the security of Afghanistan and Iraq. What are the main impediments in this way, what do the two countries need to do to pave the way for the betterment of the ties and how much time does it take for them to set off? A: I think it would take some time, I can’t judge on that at the moment. I think we have mutual interests in Iraq, in terms of stability and security, and basically seeing that the democratic choice of the people of Iraq goes ahead and the rights of minorities are respected. In Afghanistan, in the next years, there will be important opportunities to encourage the Afghan parties to see if they can find a mutual resolution to the situation and encourage Pakistan to support that and have the other countries in the region and beyond to become part of that process of encouraging a kind of stability, particularly for Iran which lives between these two countries in the region. I think it to be an important consideration, and I don’t see major differences here. I think on other questions, there may be long-term differences which will take more time to resolve. At this stage, I don’t have any timetable but I think it’s important to address questions of stability and security where we have common interests at the beginning point as a way to help that encourage more faith, trust and confidence in each other’s actions. Q: In terms of the expansion of bilateral ties between Iran and the United States, how do you evaluate the importance of cultural ties and exchanges? Iranian people have always complained that the U.S. media portray a biased an unrealistic image of Iran and show Iranians as uncultured and uncivilized people. How should the U.S. mainstream media correct this image? How should the two countries use culture and media as a tool for the improvement and reconstruction of mutual relations? A: I put your finger on another area which misunderstanding and mistrust is being generated by the failure to have as much understanding about each other’s history, background and culture as we should have. That all plays an important role in bringing the countries together, and there’s no question that Iran has a great history and culture. I had the privilege and pleasure to be a tourist in Iran in 2004 and see much of that for myself and come to understand how gracious and welcoming the people of Iran were and many Iranians come to the United States, and this is something that hasn’t stopped but perhaps the more limited. We have to see how we can open that up. We had extremely good relations for a number of years between our academies of science which have worked closely together in building some mutual understanding and sharing their interests on common fields of endeavor, so we have more than a zero-base to build on. My own feeling as well is that perhaps the first thing that might be important for both sides is to find a way to quiet some of the negative comments that seem to otherwise have been part of the non-dialog between us. I think that the sort of good diplomacy particularly with countries which are distant from each other with difficulties can begin with doing no harm to each other, like the text in Ancient Greek and some kind of oath which the medical people are used to take. I think it’s good for people to think about the fact that if we are going to make effective changes, we don’t begin by trying to create animosity, misunderstanding and tensions. Q: And for the final question, I would like to ask you, as a veteran diplomat, to send a message to the Iranian people. At this critical juncture that the possibility of a new beginning in the Iran-U.S. relations has emerged, what’s your message to the Iranian people? A: My message is that the American people have paid attention to, and look on with great interest, the changes that are taking place in Iran and I believe and try to respond in ways that are positive that the American government is certainly discouraging any more sanctions being applied while this delicate opening period is going through, and my hope is that there will be support in Iran as it has been reflected in the election of President Rouhani for a process that may take a little time and will require some hard working on both sides. That will require, as we have said to each other, a course of conversations and compromises that may not be always endorsed by all elements in the society. But I would hope that people in Iran will continue to ask, as they did while I was there almost 9 years ago, “when will we have better relations with America?” And I hope the American people will ask when they can have better relations with Iran. I think that on both sides, the popular interest is very important, and the popular interest is certainly on the direction of solving the problems and opening the door, and I look forward to the day, that I cannot tell when it will be, when we will have more direct, more open, more institutionalized relationships and see how we can work on that direction however long it takes us.